Gibson Knott is part of the delightful ridge that runs west from Helm Crag, overlooking Far Easedale. The ridge runs between the Greenburn valley and Far Easedale, and is really best walked as a single object, heading from Helm Crag over Gibson Knott to Calf Crag and then returning along one of the side valleys. Gibson Knott is only really a clear distinct summit when approached from the east. The ridge drops down from Helm Crag to Bracken Hause, and then climbs up a nice rocky step onto Gibson Knott. At the top of this climb the ridge turns slightly to the left and then continues west at a fairly even altitude for about a mile, before climbing up again to Calf Crag. The start of this climb will serve as the western boundary of Gibson Knott, although is more properly Moment Crag. 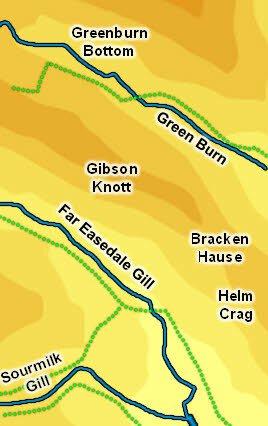 Gibson Knott is best visited along the ridge path, which can be started either at Helm Crag or from the head of Far Easedale. There is also a path that comes out of Greenburn, leaving the valley level with Moment Crag and reaching the ridge just before the climb up to Calf Crag - to reach Gibson Knott follow this path then turn back east to reach the summit area. Our ascent of Helm Crag continues on along Gibson Crag and Calf Crag, returning via Far Easedale. The summit ridge is an undulating area with plenty of rocky outcroppings. Which one is highest isn't entirely clear so visit them all! Gibson Knott can only really claim two becks. In the south Far Easedale Beck runs along the foot of the entire fell, with little more that minor nameless brooks above it. To the north Green Burn performs the same function, running along the base of the slightly smoother northern slopes, again with no significant tributaries. Gibson Knott has no tarns.